After I was first introduced to Xavier Dolan at Cannes 2010 with his second feature (Heartbeats), the Quebecois filmmaker has returned to Cannes this year with his fifth feature - titled Mommy. As goofy as that title may sound, this film is incredible. I already raved about it in my 10/10 review, but it takes the #1 spot because it was the most exhilarating experience I had in Cannes. The film is about a mother (Anne Dorval) trying to raise a wild ADHD teen (Antoine-Olivier Pilon) in a fictional Canada (explained in the film), and it's presented in a 1:1 format, like Instagram. But there is a scene where it briefly opens up to widescreen and in that moment I truly felt completely and totally in awe, realizing then and there that I was part of the way through watching a masterpiece. Everything about it: it's visually striking, emotionally enriching, and thoroughly engaging, in every last beat that we follow in the life of this family. Dolan is only 25 years old, but he clearly represents the next generation of filmmakers pushing cinema forward. Bravo. As much as I've enjoyed director Bennett Miller's last two films (Capote and Moneyball), for whatever reason I wasn't expecting this one to impress me as much as it did. Miller, who also won Best Director at Cannes, tells a very fascinating story about two gold-medal-winning wrestling brothers, David and Mark Schultz, played by Channing Tatum and Mark Ruffalo. The three lead performances, including Steve Carell as their coach and eventual murderer John du Pont, are exceptional and will certainly receive acclaim outside of the festival. But it's the story itself, and the decisions Miller makes in how to tell this story, that make this film so damn good. While set in the late 1980s, Foxcatcher subtly and smartly touches upon the contemporary concerns of the financial gap in our society, as well as talent vs. money. It's one of the few films that I would've happily watched a second time in the very same day, if I had the opportunity. This movie is awesome. The best discovery of Cannes 2014. I walked into this film knowing nothing about it or the filmmaker, and that's the best way to see it. While it's not as zany, if you love crazy fun ski movies like Hot Dog or Ski Patrol, Force Majeure is a brilliant modern take on that kind of ski movie comedy, but with added depth to the characters. It's actually much more of a dark comedy, following a family on a ski vacation in the French Alps that experiences a "close-call" with an avalanche. This changes the dynamics for the rest of their trip, and we watch as the husband and wife argue, the kids cry, and the snow fall amidst social chaos. It's so much fun, and there's nothing like watching a beautifully shot, Swedish dark comedy set in the Alps with a satisfying conclusion. We just posted the trailer for this, as I hope to bring attention to it. The latest film from already-acclaimed Belgian brothers Jean-Pierre & Luc Dardenne, Two Days, One Night stars the not-so-working-class-but-still-beautiful Marion Cotillard as a working-class woman about to lose her job, desperate to convince her co-workers to keep her on board. The Dardennes say more about our society and struggles with making money in only 90 minutes than most filmmakers can achieve in 3 hours. It's brisk, it gets right to the point, and it delivers, even if you figure out exactly where it's going to end early on. That's what is so great about it - the experience of watching Cotillard do what she has to do, and secretly cheering at every victory, makes this an inspiring and entertaining watch. Even though, admittedly, it was my very first Dardenne Brothers film, I totally fell head over heels for it. I can't wait to explore more of their work after this and if anyone else needs an introduction these filmmakers, this isn't a bad film to begin with. The more I think back to this film, the more it grows on me. It is very simple: a man in a crime-ridden, post-apocalyptic Australian outback just wants to get his stolen car back. Guy Pearce plays that man, and it's set in a dirty post-apoc Mad Max-esque wasteland, where the violence is visceral, the people are slimy, and everything is covered with a gritty dust. Similar to Drive, one of my favorite films of Cannes 2012, the power of The Rover is in its silence, and it uses that silence (and minimal dialogue) very effectively to convey so much, to speak loudly without being loud. The more I think about the story, as simple as it may be, the more I think about what wasn't said, and what director David Michod doesn't show us, the more I realize there's an immense depth to this that goes way beyond all the grit and grime on every person in it. Two other films I have to mention as runner-ups: Zhang Yimou's Coming Home made me cry more than any other film at the festival, and the last shot is heartbreaking, but oh so beautiful. Not everyone will love it as much as I did, but it's made with love and will hopefully connect with others, too. On the flipside, Pascale Ferran's Bird People is not a good film, with two disjointed segments that lack substance, except for one scene in the second half. It might be my favorite scene of the fest, where a bird interacts with a Japanese man at a hotel. He paints images of the bird while she flaps around in his room, and the connection between the two is wonderful. Despite not liking the film much, I loved this scene and want to specifically mention it. And that's it for Cannes 2014, wrapping up my coverage of this year's fest. Nuri Bilge Ceylan's Winter Sleep won the Palme d'Or - find the full list of awards winners here. My coverage will finalize with this list and a few more reviews/interviews on the way. I'm already looking forward to returning to Cannes next year, but that's a very long ways away and right now I just want to get some much-needed rest back at home. Just okay on Mr. Turner? Everything I've heard about that film has been nothing but positive so far. I'm super jealous you got to see these films though. I've been dying to see Foxcatcher for some time, I can't wait. I am not a Mike Leigh fan. I can't stand his films (his recent few that I've seen), they are incredibly dry, extremely boring, and he focuses on these odd vapid character moments more than any meaningful interactions. Others may like seeing that stuff, but I found Mr. Turner to be worse than a slog. It's 2 1/2 hours, painfully long, and spends so much time on really dull parts of this man's life. He wastes that time trying to give us a very small sliver of who he was, while he could've instead spent 90 minutes giving us a more grand yet still intimate look at this painter. That's all. That still from MOMMY looks disturbing. Please tell us more about the "way" that Godard and Cronenberg have lost. What was it and where might we find it now? First, you can find it in the dictionary here: http://dictionary.cambridge.org/dictionary/british/lose-your-way They've lost their intelligence, their attention to detail, and ability to tell a coherent story that isn't a mess. Both of the films were awful, without much substance beyond experimentation. Cronenberg lost his way in Hollywood, I couldn't tell if the film was making fun of that world or strangely fascinated with it in a disgusting way. Godard is just an old man who can't think straight anymore and shouldn't be playing around with a camera at all, but just because he still is some think it's art. I don't think it's anything but trash; his film belongs on YouTube, not at Cannes. That's a problem with Cannes every year where old directors are invited when obviously they are no longer making good movies but they are big names and will make for a great red carpet event. Though for Croneneberg it's only his 2nd incoherent movie. Woops! Got it, thanks, will make the correction. Great list, these are the films I most wanted to see, save for The Rover which I hadn't heard about. So White God was eh? Curious to see in what way that premise was attempted. Great list and a great festival. Too bad I didn't have time to catch most of the best ones. 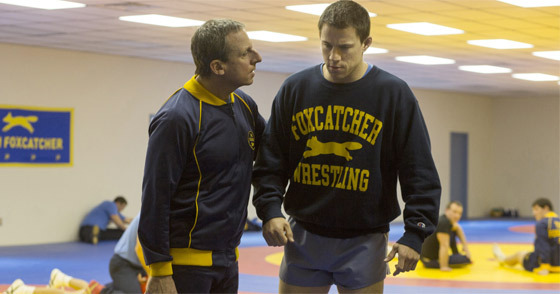 Foxcatcher should get a screenplay academy award. Gosling was very well shot, edited and the sound is great too but the story itself was very pretentious.